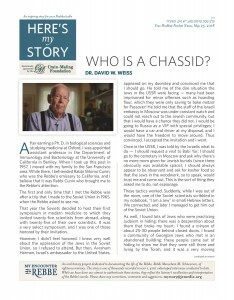 Home » Uncategorized	» Who is a Chassid? After earning a Ph. D. in biological sciences and studying medicine at Oxford, I was appointed assistant professor in the Department of Immunology and Bacteriology at the University of California in Berkley. When I took up this post in 1957, I moved with my family to the San Francisco area. While there, I befriended Rabbi Shlomo Cunin, who was the Rebbe’s emissary to California, and I believe that it was Rabbi Cunin who brought me to the Rebbe’s attention. The first and only time that I met the Rebbe was after a trip that I made to the Soviet Union in 1965, when the Rebbe asked to see me. That year the Soviets decided to host their first symposium in modern medicine to which they invited twenty-five scientists from abroad, along with twenty-five of their own scientists. It was a very select symposium, and I was one of those honored by their invitation. However, I didn’t feel honored. I knew very well about the oppression of the Jews in the Soviet Union, so I refused to attend. But then, Avraham Harman, Israel’s ambassador to the United States, appeared on my doorstep and convinced me that I should go. He told me of the dire situation the Jews in the USSR were facing – many had been imprisoned for minor offenses such as hoarding flour, which they were only saving to bake matzot for Passover! He told me that the staff of the Israeli embassy in Moscow was under constant watch and could not reach out to the Jewish community, but that I would have a chance they did not. I would be going to Russia as a VIP with special privileges; I would have a car and driver at my disposal, and I would have the freedom to move around. Thus convinced, I accepted the invitation and I went. Once in the USSR, I was told by the Israelis what to do – I should request a visit to Babi Yar; I should go to the cemetery in Moscow and ask why there’s no more room given for Jewish burials (since there obviously was available space); I should always appear to be observant and ask for kosher food so that the Jews in the woodwork, so to speak, would trust me and come out. This is the sort of thing they asked me to do, not espionage. These tactics worked. Suddenly, while I was out of the room, one of the Soviet scientists scribbled in my notebook, “I am a Jew” in small Hebrew letters. We connected, and later I managed to get him out of the Soviet Union. As well, I found lots of Jews who were practicing Judaism in hiding; there was a desperation about them that broke my heart. I found a minyan of about 25-30 people behind closed doors. I found a community of Georgian Jews who met in an abandoned building; these people came out of hiding to show me that they were still there and living by the Torah, and it was a very moving experience that impacted my entire life. After I returned from my trip, the Rebbe invited me to come see him. I brought my oldest son, Hillel, who was then seven years old. The audience was late at night, and he was not able to stay awake. I walked into the Rebbe’s office and sat down, with my son nodding off on my lap. When the Rebbe saw this, he came around his desk and picked him up, and the rest of the time, I spoke with the Rebbe with Hillel sleeping on the Rebbe’s lap. The audience was supposed to last twenty minutes – that’s what I was told by the Rebbe’s secretary. Sure enough, after twenty-five minutes, the door opened a crack, through which I could see a pair of eyes looking at me not very happily. But the Rebbe lifted his hand and the door closed. All told, the audience lasted about two-and-a-half hours or maybe three. I cannot be sure, but I do know that I arrived around 10 p.m. and I left after 1 a.m. The Rebbe wanted to know every single detail about my trip to Russia. I told him everything that had happened which took a while, and all along the way, the Rebbe asked me many questions. When we were finished talking about Russia, the Rebbe said, “I’d like to talk to you about what you do in science,” and he began asking me about the theory called “trauma immunology,” which was very new at the time, and which has since become quite famous. This theory holds that since the body has an immune system to recognize viruses, bacteria and cancer cells as alien and reject them, then maybe the reason people get cancer is that, due to trauma, this system stops functioning or doesn’t function well enough. It is a complicated theory, and I found the depth of his understanding and questioning absolutely astounding. Dr. David W. Weiss of blessed memory is a scientist who has moved to Israel in 1966. He was interviewed in his home in Jerusalem in September of 2015.